We have considered the output of a longitudinally pumped, heavily doped Er:Yb:Cr:phosphate glass laser. We experimentally observed that the characteristic output-versus-input curve is not linear and exhibits bistability. 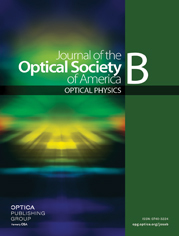 A theoretical approach, based on a thermal lensing effect that varies depending on whether the laser is on or off, provides an excellent description of the experimental results. In addition, we observed that the laser operates in a self-pulsing, sinusoidal, or cw regime, although the pumping is continuous such as was already observed in erbium-doped fiber lasers. This effect is attributed to the existence of ion pairs acting as saturable absorbers. Unlike for erbium-doped fibers, we demonstrate that the concentration of ion pairs cannot be deduced from the pump transmission through the amplifying medium because of the presence of ytterbium ions.